As of today, Claire and I are officially homeowners. We are on the property ladder and all grown-up! Well, the grown-up bit is up for debate. This has been a few months in the making, but I was reluctant to blog or tweet anything, until it was confirmed and we had the keys in our hands. Making any announcement anytime sooner would be tempting fate. We are not moving far. Not only are we staying in the same area of Bath, but we will be living on the same street! Just a couple of hundred yards up the road. We love the area where we live and it is very close to where both of us work. We also knew that we couldn’t rent forever – we were at the mercy of the landlord, who could evict or put our rent up, without us being able to do anything about it. Not anymore! No more getting permission to hang a picture on the living room. 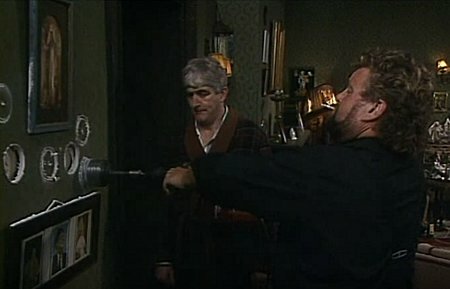 If we want to drill a massive hole in the wall, we can. There has been loads to sort out with the house. I must have spent hours on the phone to and emailing mortgage brokers, solicitors and insurance companies. That’s all before moving in. Now it’s a case of getting a locksmith to fit new locks, getting a plumber to install a dishwasher *, calling the energy supplier to give our readings and obtain a Smart Meter, getting Sky installed **… the list goes on! * Yes, a dishwasher. We are finally getting a dishwasher. Since I left home in 2006, I have always had to wash by hand. I hate it. I would rather clean the toilets, after someone had explosive diarrhea. ** We need to get our Sky TV and internet ASAP. I was devastated to learn that we will be without internet for almost two weeks. No Sky+ for almost three! These utilities are up there with air! Never mind if we’ve got no running water – we need our television and internet access. Pray for us and send the Red Cross round. I will try and take some photos to upload soon. At the moment, the house is looking very empty as we are yet to move in. The big removal day is Thursday. We have someone to pack our stuff and take it up the road for us – a man with a van; or more likely men with ven. About 3am, I awoke from a deep sleep, having a coughing fit. I don’t have a cough and in my dazed state, it was a little scary. I could hardly breath. Was this the end for Sean? Quite clearly, as I am writing this, I survived. I can only assume that I swallowed one of the small moths, which have recently taken up residence in our house, where no amount of killing (and eating) them, reduces their numbers. I went on a killing spree yesterday. I felt just like Arnold Schwarzenegger. There was death and much bloodshed. I started my murderous rampage when I discovered an ants nest in the porch of our house. Ants living inside our house! This was totally unacceptable. I can tolerate ants in the garden, but when they cross the boundary into my house, action had to be taken. We have a can of Raid insect killer in our front room. This is kept in case a spider ever runs across our carpet. I am too scared to try to catch the things and release outside, so just spray them to death with poison. Luckily for me, the spider spray is also very good at eradicating ants. I emptied most of what remained in the can onto the ants nest. Hopefully that’s them dead and never to be seen again. I know karma will catch up with me soon, and a tarantula will come striding across the carpet – I’ll have no Raid spray left to protect me and will end up cowering in the corner in fear. 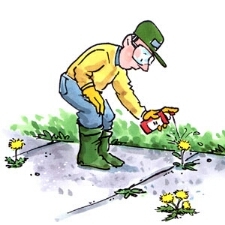 With the smell of ants blood still in my nostrils, I stormed into the garden, armed with another piece of artillery… weed killer. Our back garden has been taken over by weeds. We have this problem every spring. As soon as winter has passed and the sun comes out, the weeds decide to come to life come out in their droves. Our patio was like a big weed rock festival. They have all been sprayed and will hopefully be like the ants… DEAD. Spiders. I know I shouldn’t be bothered by them, I really do. To be fair, it’s only those huge house spiders which trouble me. The ones which are as fat as a pig, with legs like tree trunks. Despite their hideous appearance, I know all too well that they are harmless. One creepy crawley which is not harmless the wasp. This morning, there was a huge wasp on the curtain in our house. This was was big too – almost as large as that dead one which I featured in ‘Bug Top Trumps‘ a while ago. I was brave. I caught the insect, using a pint glass and an envelope. It was then released into the community. There were no tears, no shitting in terror or tantrums. In fact, I showed no fear at all. This is because I am not scared of wasps. I really need to start getting things into perspective. Wasps can hurt you. Big spiders cannot (at least not in this country). Therefore, I should stop being a scardy cat when it comes to arachnids and develop a new phobia of bees and wasps. A huge moth flew into the office today. It came out of Pav’s bag, which begs the question how often he opens it and worse still, what else is inside, if moths are taking up residence within it. The moth was huge and bared more similarities to a bat. I don’t have a phobia of moths, although this one scared me, due to its size. Nothing that large can be safe – it must surely feed on blood. Luckily, it hid away in the corner of the window frame. I bravely took a photo. Thinking the moth would stay hidden and not cause any disruption or harm, I got on with my work and thought no more of it. 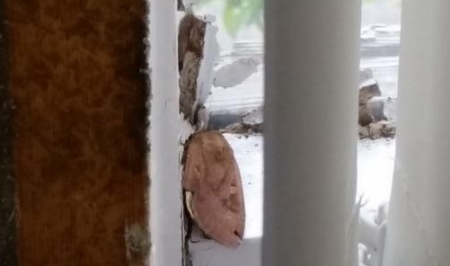 A short while later, while explaining to how to use a memory stick to a visiting customer, I noticed the moth flying and crawling around behind my computer monitor and on the wall. I don’t think the customer saw the creature. If he did, he certainly didn’t comment on it. He must have, however, noticed me looking rather perturbed. I hope he did not think that I was scared of him or his flash drive. I don’t know where the moth went, and quite frankly, I don’t want to know. I hope I never see it again. However, if I come in tomorrow, open my desk drawer and get attacked by the winged monster, I’ll be sure to blog about it. If it doesn’t kill me, that is.